The contents of this site including, but not limited to, the text and images contained herein and their arrangement, are subject to copyright. The copyright is owned by Booroodabin Community and Recreation Club Inc. or in the case of some material, a third party. You may view this site and its contents using your web browser and electronically copy and print hard copies of parts of this site solely for personal, non-commercial use. Any other use, including the reproduction, modification, distribution, transmission, republication, display or performance of the content of this site is strictly prohibited. You agree that your access to, and use of, this site is subject to these terms and all applicable laws, and is at your own risk. This site and its contents are provided to you on “as is” basis; the site may contain errors, faults and inaccuracies and may not be complete and current. Information provided on this site does not make any warranties as to the fitness for a particular purpose of any particular product or service. Booroodabin Community and Recreation Club Inc. makes no representations or warranties of any kind, express or implied as to the operation of this site or the information, content, materials or products included on this site, except as explicitly stated, or otherwise provided under applicable laws. Neither Booroodabin Community and Recreation Club Inc., nor its affiliates, directors, officers, members, employees, agents, contractors, successors or assigns will be liable for any damages whatsoever arising out of, or in any way related to, the use of this site and any other site linked to this site. This limitation applies to direct, indirect, consequential, special and punitive or other damages you or others may suffer, as well as damages for loss of profits, business interruption or the loss of data or information. This site may contain links to third party sites. Booroodabin Community and Recreation Club Inc. is not responsible for the condition or content of those sites. You access those sites and/or use the site’s products and services solely at your own risk. 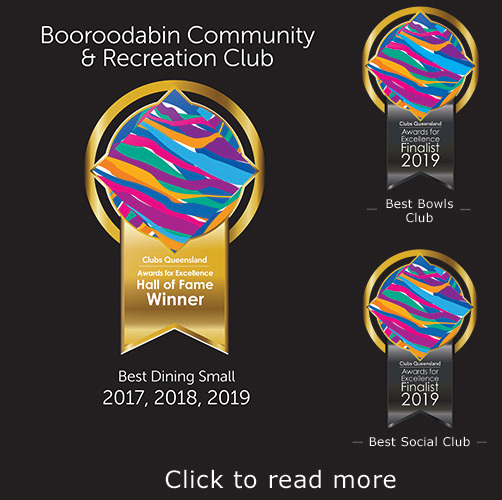 The links are provided solely for your convenience and do not indicate, expressly or impliedly, an endorsement by Booroodabin Community and Recreation Club Inc. of the sites or the products or services provided on the site. enforced in accordance with the laws of Queensland, Australia. Disputes arising from your use of this site are exclusively subject to the jurisdiction of the courts of Queensland, Australia. This site may be accessed throughout Australia and overseas. Booroodabin Community and Recreation Club Inc. makes no representations that the content of this site complies with the laws (including intellectual property laws) of any country outside Australia. If you access this site from outside Australia, you do so at your own risk and are responsible for complying with the laws in the place where you access the site.